My Kitchen Aid stand mixer and I are best friends. We hang out together often and know each other well. We've been together for 9 years now, so we have had a lot of time to learn all the little intricacies of one another. I can whip up a batch of cookies in no time at all with my trusty friend and sometimes I feel like I could do it with my eyes closed. We are pretty tight. My candy thermometer and I on the hand, are just getting to know each other. We've only been together less than a year and I'm still a little leery of this guy. I'm not quite ready to go steady yet, but I look forward to an occasional date. The dates are usually fun (but sometimes are a flop) and always involve something new and exciting! 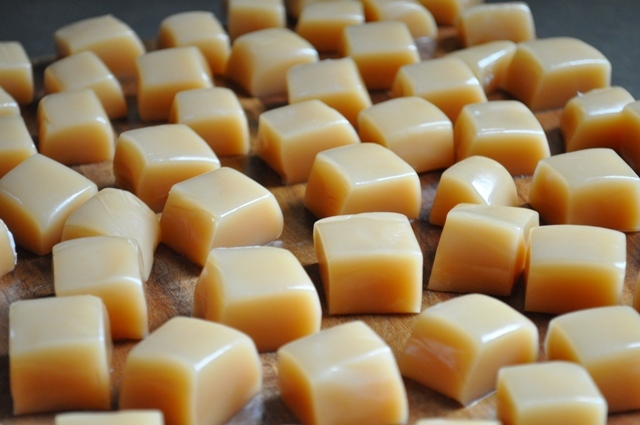 This week we had an awesome date making Honey Cream Caramels. The date got off to a slow start. Boiling sugar is always a little scary and it involves an incredible amount of patience and attention. Sounds like like a typical man, right? Anyway, the ingredients are simple. Sugar, honey, heavy cream, salt, corn syrup and a tiny bit of butter come to a ferocious boil in medium to large heavy bottomed saucepan. Make sure your pan is big enough because you don't want this magma like sugar to boil over. My, gurgling, bubbling, sometimes sputtering, caramel lava took about 25 minutes to come up to "firm ball" temperature (250 degrees) on the candy thermometer. All the while you have to stir the mixture continuously. I was beginning to wonder if it was ever going to make it. I'm not very patient. Plus I always think my candy thermometer is playing hard to get by laying low. But then our date took an exciting turn and finally my guy came through and delivered those last 15 degrees! The minute the caramel hit 250 degrees I removed the pan from the heat, stirred in some vanilla extract and poured the delicious golden magic into a prepared 8x8 ceramic baking dish. Wow! We did it! Okay candy thermometer...I'll think about taking our relationship to the next level. Meanwhile I had to exercise more patience as the caramel cooled and set up. I decided the best thing to do was wrap it up and let it sit overnight because I didn't have good lighting to take photos anyway. My giant caramel took a little coaxing to release from the buttered pan. I also buttered my cutting board and my knife and got to work cutting it into bite size pieces. I found it easiest to pull a very sharp chefs knife through the caramel (instead of using a chopping motion). Once it was in strips, it was easy to cut into about 1 inch pieces. I used the width of my thumb as a general guide to cut each piece. 8 strips of caramel quickly multiplied into about 82 pieces of caramel! 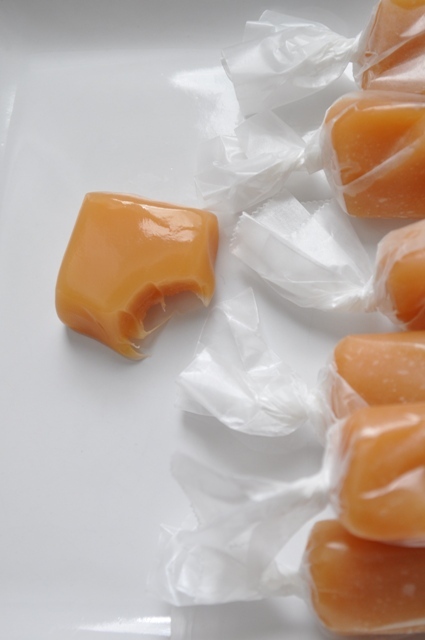 I cut 4 1/2 by 4 inch pieces of wax paper to wrap each caramel in. It was a bit time consuming wrapping 80+ pieces of candy, but I also found it therapeutic and satisfying to hand wrap each treat. There's something nice about it that I can't quite find the right words for, so you'll just have to take my word for it. 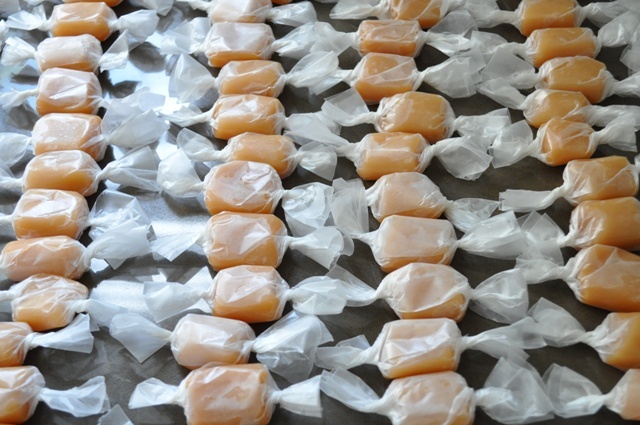 So the most important question has finally arrived....how did the honey cream caramels turn out? Pretty fabulous. 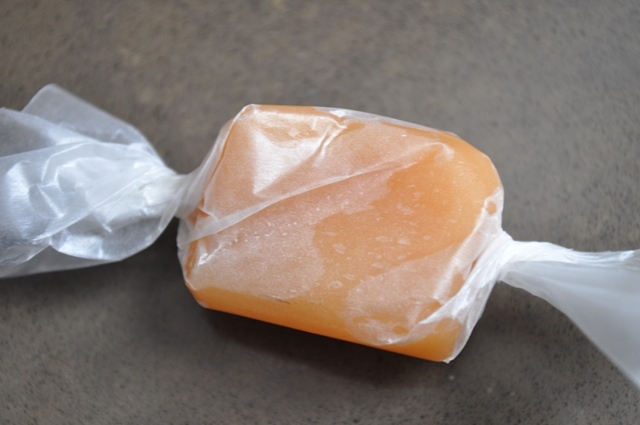 The caramel is soft, but not too sticky, and it practically melts in your mouth. The honey flavor comes through and blends beautifully with the creamy caramel. 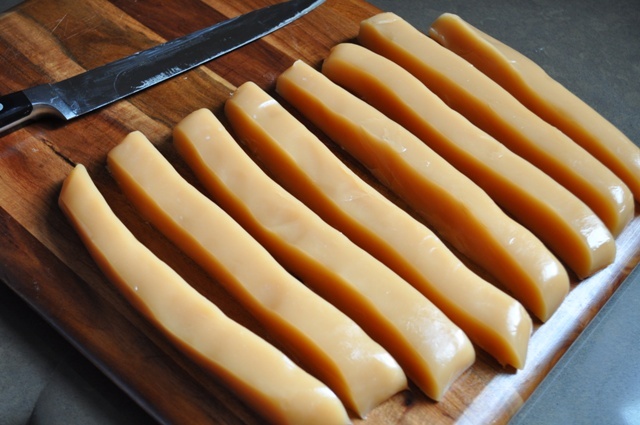 You could easily turn this into a salted caramel with a sprinkle of fleur de sel before the caramel fully sets. What's nice about these is you can make about 7 dozen in one batch and package them up in little cellophane bags and give them away as gifts. They keep up to 2 weeks wrapped and stored in an airtight container. This recipe is a winner and will be making it into my holiday treat rotation. Thanks to Carmen of Baking is My Zen for this week's Sweet Melissa Sundays recipe pick. You can get the recipe over on her site. 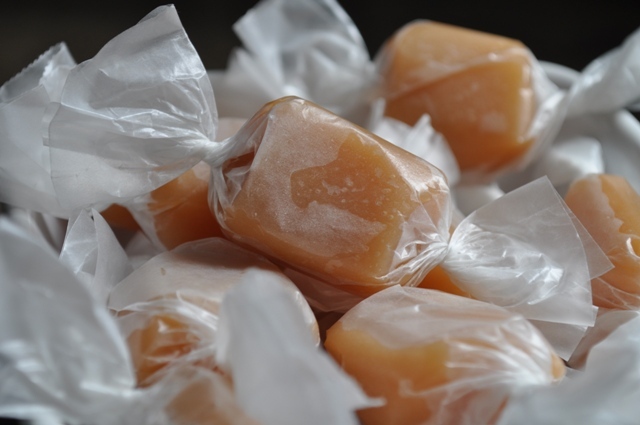 To see how my fellow SMS bakers did with their caramels click here. 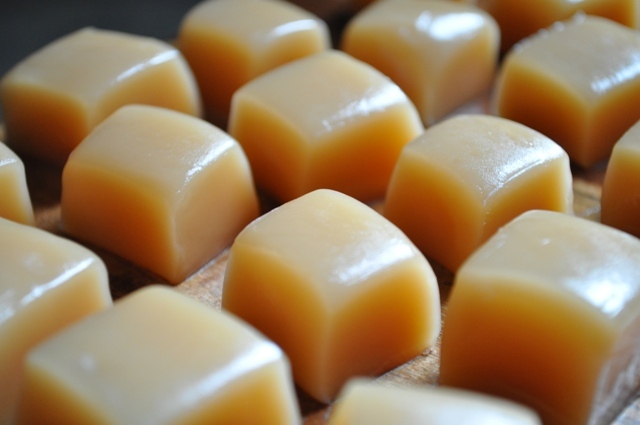 Gloria, very cute storyline...your caramels look beautiful! Lovely post! I love your photos! This is one of my favorite recipes ever. It does take forever for the caramel to reach the right temp but it is so worth the wait. Oh wow! They look amazing! I don't know if I could have taken a bite and then stopped to take a photo! 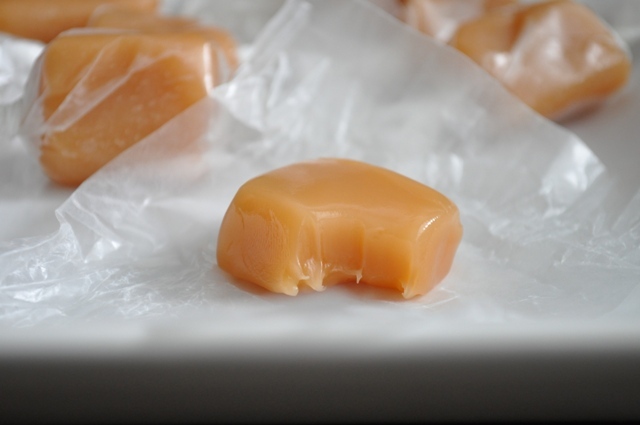 A similar recipe for caramels has been a holiday treat in my husband's family for years. I love them. Love your pictures in the waxed paper. I may have to try wrapping mine that way next time. Gloria, These look great!--your pictures are wonderful. I will have to try them. BTW, I didn't realize that you and I started blogging at about the same time...Happy one year anniversary (a bit late).